Like Il Buon Vecchio Charlie, Il Giro Strano was another of those bands that never had the chance to release an album in their career. 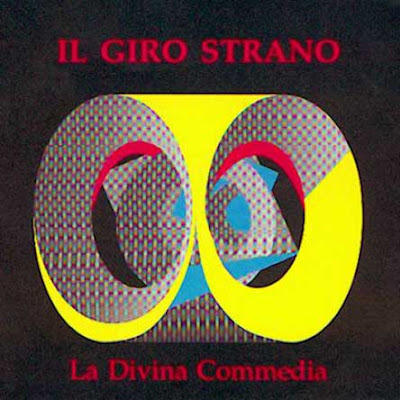 It's a pity, because their posthumously released La divina commedia CD is a very good work, despite the lack of production and some unfinished recordings. Led by the powerful voice of Mirko Ostinet, with great sax and keyboards work, this six piece from Savona created a reasonably original blend of italian prog with jazzy influences, and the five long tracks included on the 56 minutes long CD give a very good idea of what they could have been with a good production. The better recorded first two tracks have good vocal parts (though the lyrics don't always fit the music and seem a bit naive at times), and great organ/sax interplay, the rest has a lesser recording quality but it often resembles of Colosseum or other jazz-inspired prog bands. The band had been formed in the summer of 1971 by a group of musicians coming from Tramps and Voodoo, both bands very popular in the Savona area. In their two years life, they played in quite a few important italian festivals (like Villa Pamphili in Rome and the Genova Pop Meeting), and decided to split when a recording deal forced them to move to Rome. Singer Mirko Ostinet tried an unsuccessful solo career, while keyboardist Alessio Feltri later reappeared in Corte dei Miracoli. A revised line-up of Il Giro Strano was formed after Corte dei Miracoli disbanded in 1976. This new group was rather commercial and had little in common with the original band, lasting around two years. The last incarnation of this group was in 1978-79 when the only original member Alessio Feltri formed an ELP-inspired trio with bassist Silvio Melloni and drummer Mauro Biglietto (later replaced by Beppe Aleo). After a bad accident he partially left the music biz, working as sound engineer and collaborating as composer and producer in quite a few musical productions in the early 80's.